As they are want to do that initially made me feel a lot worse, but by the end of the day I was already feeling much more human – the only problem was that my total calorie intake yesterday was 500ml of Sprite and half a baguette (plain) which doesn’t really fuel the engines of a cyclist. 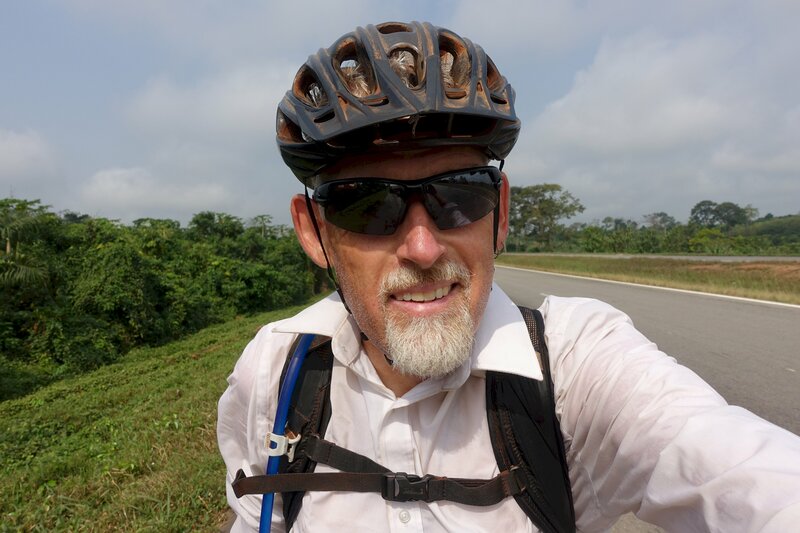 This morning I was better still, and could face breakfast before taking lunch truck to km 78 from where I rode the rest of the way in to camp – just under 60km. That should have given me plenty of time to get a couple of decent blog posts done but it was just too damn hot – even in the shade it was over 30 degrees, and now at 1945 in my tent it’s still a very humid 26 degrees. Assuming no setbacks in the night I plan to ride the full day tomorrow, 120 km, which will bring us back to the Atlantic coast which we left from Freetown a few weeks back. We’re staying at what sounds like a reasonably nice place (rather than bush camping) so perhaps there’ll be somewhere with air conditioning which I can make use of to get things done. Hi Steve, been following your blogs with interest. We are doing a similar route to yours in January on our Tandem. Banjul to Benin, probably on smaller roads and tracks in some parts. How were the police check points in Sierra Leone and Guinea? Hassle or friendly? Also how busy was the road in guinea that runs along north of Liberia to Lola and onto Man? Well written blogs, even to the last runs! Keep on cycling, keep on blogging! Dude. You must weigh like 47kg! you’re going to be addicted to antibiotics by the time you get home….